Following a yearlong selection process and a final one day shoot-out twenty three year old Robert English has been announced as the first Masters Superbike Championship 'Young Motorcycle Racer of the Year'. English was announced as the winner at the annual Masters Awards ceremony in County Kildare and will now receive a support package valued at €15,000 for his 2017 racing season. This fantastic new award was introduced by Mondello Park for 2016 and has been a huge success with nineteen riders entering the process. The championship organizers were delighted to receive backing for their unique initiative from Mondello Park owner Martin Birrane, Bishopscourt owner Jim O'Brien, Dawn International, AJ Plumbing Supplies, Pat Duke and Oxford Products which will allow them contribute financially to the next stage of Roberts career as well as providing free race wear and equipment. 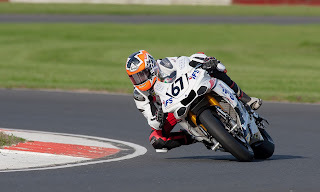 English began the year as reigning Masters Supersport Champion and following an impressive debut on his graduation to the Superbike class, was the first nominee for the Young Racer award. Over the remaining five Masters events English was joined by Aaron Clifford, Rhys Irwin, Aaron Armstrong, Jason Lynn and Luke Johnston in a strong line-up which would contest the final of the selection process. The one day shoot out to decide the best young competitor in the Masters Series took place two weeks ago at Mondello Park, where riders were put through their paces both on and off the track. Each nominee was assessed in a number of areas. Mondello Park general manager Roddy Greene assessed each rider’s presentation of their past and future careers, communications consultant Gerry Dawson assessed the nominees on their media skills while experienced racers Jeremy McWilliams and Jim Halligan assessed the riders ability with their bike both in the garage and on the track. When the points in all categories were added up it was English who came out ahead by a slender margin, in what turned out to be a very close competition. Following the shoot-out the competitors were required to wait two weeks to hear the verdict which was announced as the final award of a very successful night for the championship. Speaking after the announcement English expressed his delight saying, “This is the pinnacle of my career and the biggest prize we've ever won. It's unbelievable and incredible. I'm particularly happy to win it as it’s not something you can win by just winning races as it takes everything into account. Winning this award will make my career progression much easier and will go a long way to helping me to reach my aim of racing in Europe next year. Thanks to everyone involved in the award this will make such a huge difference to my career". 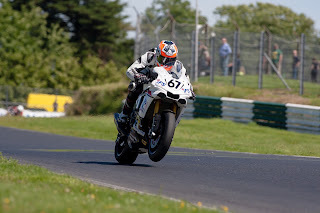 Mondello Park, the competitions supporters and the winner Robert English will agree a plan as to how they can assist him with the next stage of his career over the coming days and are all looking forward to working together to help Robert become Ireland's next big star.